Copyright © 2017 the Contributors to the Modelling Opportunity Data 1.0 Specification, published by the OpenActive Community Group under the W3C Community Final Specification Agreement (FSA). A human-readable summary is available. 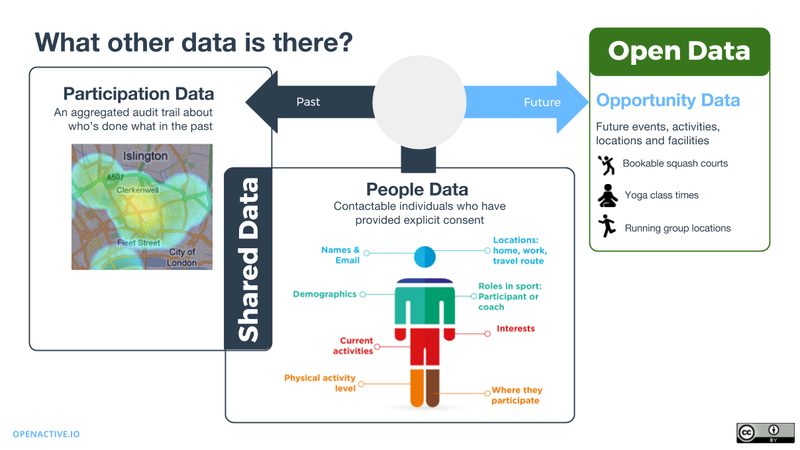 This specification introduces a data model to support the publication of data describing opportunities for people to engage in physical activities ("opportunity data"). This model covers description of activities, as well as the events and locations in which they take place. The specification is intended to support the publication of opportunity data as open data for anyone to access, use and share. It will also guide reusers of opportunity data, introducing them to the key concepts relevant to that sector. The model may also be useful in guiding the development of both new and existing booking systems and applications that consume opportunity data. The specification is an output of the OpenActive Community Group and serves as a common reference point for other specifications and outputs of that activity. Developers looking for a quick primer on the model and how to use it to structure opportunity data may want to refer to the [ Publishing-Opportunity-Data ] primer which provides a number of additional examples. The data model introduced in this document has been mapped to existing standards and vocabularies, including SKOS ([ SKOS ]) and the Schema.org ([ SCHEMA-ORG ]) types and properties. This existing work provides a useful existing framework around which the OpenActive Community Group can build additional data standards. This specification was published by the OpenActive Community Group. It is not a W3C Standard nor is it on the W3C Standards Track. Please note that under the W3C Community Final Specification Agreement (FSA) other conditions apply. Learn more about W3C Community and Business Groups. Contributions to this document are not only welcomed but are actively solicited and should be made via GitHub Issues and pull requests. The source code is available on GitHub. If you wish to make comments regarding this document, please send them to public-openactive@w3.org (subscribe, archives). The W3C OpenActive Community Group was established with the objective of facilitating the sharing and use of physical activity data. Open publishing of this data has enormous potential to increase participation in physical activities. There are several different categories of data that are relevant to physical activities. This data covers different parts of the data spectrum and is represented in the following diagram. Some of this data is shared data. It can only be accessed by specific people or groups, under terms and conditions that define how and when it can be accessed and used. This shared data includes personal data about people taking part in activities and participation data that describes how people have been involved in previous events. Collectively this is known as opportunity data. This specification has been developed to meet a broad set of requirements. The aim of the OpenActive initiative is to encourage people to be more physically active. This means that this specification should focus on the data that will help people discover these opportunities. The specification should be inclusive and support sharing of opportunity data about all types of physical activities, not just sports. Opportunity data is collected and held in a variety of different tools, platforms and websites. There is variation in the amount of detail held about individual events so the specification must provide flexibility to share what data is currently available, whilst guiding activity providers towards additional useful data to collect about events. Reflecting the wide variety of tools and platforms in use, and also that the sector is at an early stage in sharing its data more widely, this specification should not prescribe specific data formats or APIs. Ideally opportunity data could be published as JSON, XML, CSV or other formats. This specification should support extensions to allow it to be customised and revised to meet future requirements, as well as the needs of specific communities of data publishers and consumers. This specification defines a data model for opportunity data. This reflects the goal of the OpenActive initiative whose aim is to encourage the publishing and reuse of open data that might help people to become more active. The OpenActive Community Group may produce additional specifications that address these areas. The key words MAY, MUST, OPTIONAL, RECOMMENDED, REQUIRED, and SHOULD are to be interpreted as described in [ RFC2119 ]. This specification makes use of the compact IRI Syntax; please refer to the Compact IRIs from [ JSON-LD ]. Markup (elements, attributes, properties), machine processable values (string, characters, media types), property name, or a file name is in a monospace font. A definition of a term, to be used elsewhere in this or other specifications, is in bold and italics. A hyperlink is underlined and in blue. A document reference (normative or informative) is enclosed in square brackets and links to the references section. The model also helps to provide definitions of key terms that are used throughout this specification. This diagram illustrates the resources and relationships that are introduced in the following sections. A Physical Activity is an exercise, sport or other form of bodily movement that involves physical effort. Physical activities will usually have a well-understood, dictionary definition. Activities should have a name. They might also be associated with one of more synonyms that provide alternative names for that activity. E.g. "Soccer" is a synonym for "Football". This additional information may be useful to help improve search engines and improve data collection. Physical Activities may also have additional information associated with them. For example a sporting activity might be overseen by a governing body or federation. Physical Activities might also be recognised by different bodies. In the UK certain activities are recognised as suitable for educational assessments, while others may be recognised by funding bodies like Sport England. An Activity List describes a set of Physical Activities. An Activity List may be a simple list of activity names. But an Activity List might also capture additional information. A common requirement is to describe relationships between Physical Activities. One method of grouping activities is to define "broader" and "narrower" relationships. For example Judo, Karate and Kendo are all more specific examples of the broader activity of "Martial Arts". This type of grouping could also be used to describe the disciplines associated with Physical Activities. For example olympic and open water swimming. An Activity List might also group Physical Activities into collections. For example swimming, water aerobics, and water polo might all be classified as "Water Sports". Water polo and football might also be grouped into a collection of "Team Sports". An Activity List may include any number of collections of Physical Activities. As shown in the example above, an individual Physical Activity might be present in more than one grouping. Some systems may choose to use grouping and hierarchical relationships between Physical Activities to help people find opportunities to be active. For example a search engine might offer users results for all types of Martial Art, or for Karate specifically. The proposed model for Activity Lists is based on the [ SKOS ] standard for publishing controlled vocabularies. It is not a requirement that systems store, publish or use relationships between Physical Activities. A system may choose to treat Physical Activities as simple tags or categories associated with Events. Other systems may define a fixed list of Physical Activities that are used as a controlled vocabulary to guides user input and data collection. Others may adopt a more complex hierarchical approach. This specification doesn't place any requirements on how applications manage or use Physical Activities or Activity Lists. There is no requirement that applications that implement this specification must adopt a single standardised list, or agree on standard groupings. The intention here is to just capture a useful model that can represent the variety of data currently in use. However there are benefits to the physical activity sector in convergence on a standard list of activities in order to improve discovery, reporting, etc. The OpenActive Community Group are developing a standard list as a separate activity. For more information see [ OpenActive-Activity-List ]. An Event is an opportunity to take part in a Physical Activity. Events take place at a specific location (see below) at an agreed date and time. Some Events are one-off occurrences. For example a fun run organised by a local group may run as a standalone event on a particular date. Other events take place on a regular schedule. For example a weekly gym class may run every Wednesday evening at 7pm. While a local walking club might meet on a Saturday morning once a month. In order to simplify terminology we recommend the use of the term "Event" to refer to both individual occurrences and regularly occurring events. It is useful to publish data about both individual Events and those with recurring schedules. People looking for opportunities to be active will be interested in both specific questions ("what can I do tomorrow") and more general information about scheduled activities. There are a variety of ways to categorise and describe events. This includes restrictions on attendance, aspect of suitability for different audiences and fitness levels, and a mixture of pre-requisites such as the need for certain qualifications, membership or equipment. The initial version of this specification prioritises capturing the essential elements of describing an event. The structured information about time, place and activity is supplemented with some basic descriptive properties. This also includes the ability to add "tags" to an event to capture a variety of categorisation elements. Future versions of this specification will use experience working with real-world data to decide the best approach of formalising these categories. Events have organisers. An event organiser might be a Person or an Organization. The organiser of an event is the person or organisation who arranged and/or hosts the event. The organizer will be the person or organisation who is ultimately responsible for an Event. Examples of organisers might be coaches, or a local sports club. Events may involve other named individuals or organisations. Examples might include named staff who will be participating in the event in addition to the main organiser. These are referred to as contributors. In addition to their names, some systems may have additional information about organisers and contributors. E.g. links to their web sites, photos, logos or contact details. This specification provides a data model for publishing information about individual people, e.g. coaches, volunteers, etc. However applications MUST respect privacy and data protection laws and must not publish data about individuals without their consent. The ability to publish this type of data has been included because event organisers often choose to publicly share some information about themselves to help advertise an event. E.g. their name and some background on their qualifications or experience. But this information MUST not be published as open data without getting the consent of the individual concerned. In addition to this, data publishers will have different approaches for capturing location data. a description, e.g. "Meet by the lake, in Victoria Park"
This specification uses Place as a general concept to refer to all types of locations, venues and facilities. The concept of Place therefore covers general outdoor areas such as parks, event venues (e.g. a Leisure centre) and facilities within a venue (e.g. a squash court, running track, etc). Facilities are contained in Places. To help distinguish between equipment and facilities: facilities will be fixed features of a location, e.g. squash courts or a walking trail; equipment will be items like table tennis tables that may be moved around a facility. Events are often organised and run in a variety of different ways. This tailoring might include adjusting the activity to a particular type of participant, demographic. Or it could include running the event in a particular style, e.g. with a fixed routine or sequence of activities. A Programme describes a method of carrying out a Physical Activity. Some programmes are very loosely defined. While others are more structured and may be run to a specific agenda or in a particular style. Programmes provide another means of tagging or describing Events to help describe them to participants. When participants are looking for opportunities they may be interested in discovering Events based on either the general activity (e.g. Running) or a specific programme (Back to Netball). The common elements here are that facilities are provided for use at a time of the participants choosing (within limits of opening hours or availability), rather than at a time or schedule specified by the organiser. take place in a location, e.g. "Victoria Park Mountain Bike Trail"
have other descriptive attributes, such as suitability for particular types of participants, fitness levels, etc. In this specification this type of self-guided activities will be referred to as Activity Opportunities. Some opportunities are freely available for anyone to attend. Others are only available to members or paying attendees. An Offer is used to describe the terms under which a participant can pay to attend an event. The concept of an Offer is taken from Schema.org, which itself references the Good Relations vocabulary for ecommerce. The data model described in a later section is not intended as a complete specification. The concept is introduced in this version of specification to highlight the support available in Schema.org for associating offers with events. Later versions of the specification will explore the area of booking in more detail. The data model described in the following sections reuses existing standards and vocabularies which have then been extended to cover the additional requirements needs to support the publication of opportunity data. The Simple Knowledge Organisation System ([ SKOS ]) is a W3C standard for publishing taxonomies and category schemes. It can be used to help publish and organise Activity Lists and to describe Physical Activities. Schema.org [ SCHEMA-ORG ] provides an existing well-used and documented data model for publishing data to the web. It provides an existing model for describing Events, Organisations, People, and Places. Both standards are widely used, and can be used to publish data in a variety of structured formats, including [ JSON-LD ]. The OpenActive Vocabulary [ OpenActive-Vocabulary ] is a custom vocabulary designed to support the publication of opportunity data. It defines a number of new terms that extend SKOS and Schema.org to cover additional requirements highlighted in this specification. Developers looking for a quick primer on the model and how to use it to structure opportunity data may want to refer to the [ Publishing-Opportunity-Data ] primer which provides many more examples. In the following sections all referenced terms have been qualified using their namespace prefix. This highlights the source vocabulary in which they have been defined. Terms have also been linked to their definitions. The examples in each section use [ JSON-LD ] syntax and reference the OpenActive JSON-LD context defined by [ OpenActive-Vocabulary ]. The context removes the need to use explicit namespace prefixes in the JSON documents. The context also maps the JSON-LD @type and @id properties to simple keys (type and id). This further limits the amount of JSON-LD syntax exposed to developers. The following table provides a high-level summary of how the concepts introduced in the previous sections map to definitions in SKOS, Schema.org and the OpenActive Vocabulary ([ OpenActive-Vocabulary ]). Activity List skos:ConceptScheme Activity lists are controlled vocabularies and map well to the definition of a SKOS Concept Scheme. Activity Opportunity oa:ActivityOpportunity An opportunity to carry out an activity at a location, at a time of the participants choosing. Offer schema:Offer Schema.org provides an existing model for describing offers to pay to participate in an Event. This specification adopts the same approach as Schema.org and encourages the use of URLs as unique identifiers for resources. Information about Events, Places, Organizations and other types of resources should already have been published online to make that information accessible to users. Using existing URLs as identifiers avoids the need to define a new identifier scheme for resources described in opportunity data. There will generally be a single canonical URL for a resource, e.g. the homepage for an Organization or Place, or a public web page advertising an Event. schema:identifier - provides a means of sharing non-URI identifiers for a resource, e.g. a company or registration number for an Organization, or an internal identifier for an Event. Applications MAY use this as a unique identifier for the resource, if there is no @id available. In short, the @id property provides a unique global identifier, while the schema:url provides a means to provide a link to a public web page about a resource. If applicable then publishers may choose to use the same URI for these two properties. If an @id property is not provided then applications MAY choose to rely on the value of this property as a unique identifier. The option to use two different URLs is useful when there is a need to distinguish between a unique identifier and a public resource. For example a platform hosting opportunity data may need to assign a unique identifier to a resource that is separate to its public web page. In the above example the @id property provides a unique identifier across the hosting application. But the public URL for the Event uses a separate, customer-specific domain. The following sections include more detail about the properties available to describe each type of resource. Some properties are considered to be essential to ensure the provision of a minimally useful set of information about each resource. These REQUIRED properties must be provided. All other properties are considered to be optional but it is RECOMMENDED that they be provided where possible. Data publishers MAY include additional properties, e.g. from Schema.org or other vocabularies when helpful to describe their data. See the section on Extending the Model for more information. Applications that consume opportunity data MUST ignore any properties that they don't understand. This allows data publishing practices within the sector to evolve as required. The Schema.org schema:Event type corresponds to the definition of Event given earlier in this specification. The properties and relationships associated with the schema:Event type can all be used to describe events. 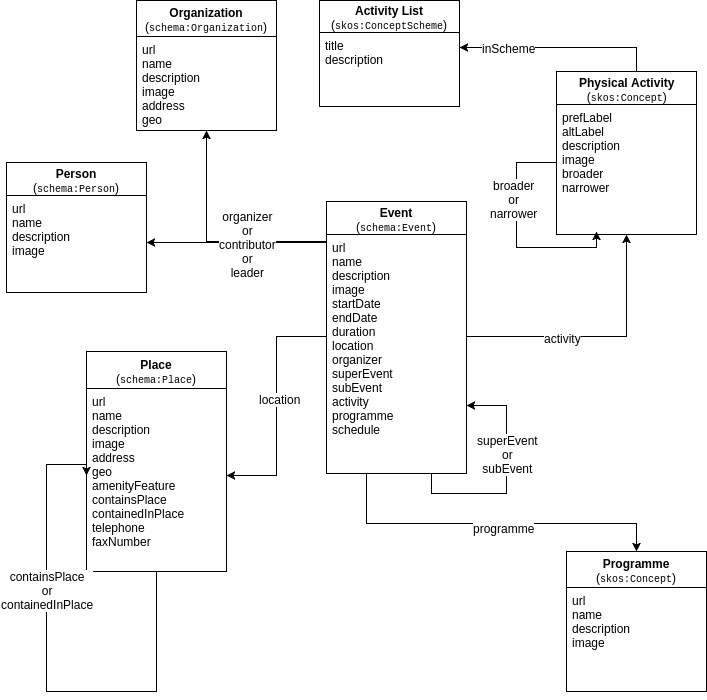 The following table illustrates how the essential aspects of describing an event map to existing Schema.org properties and/or properties defined in the OpenActive Vocabulary. The start date and time of the event. Can be specified as a schema:Date or schema:DateTime. While this property is marked as OPTIONAL, a data publisher MUST provide either a schema:startDate or specify a oa:schedule for an event. It is RECOMMENDED that publishers provide either an schema:endDate or a schema:duration for an event. schema:duration RECOMMENDED The duration of the event given in [ ISO8601 ] format. schema:location REQUIRED The location at which the event will take place. Or, in the case of events that may span multiple locations, the initial meeting or starting point. It is recommended that locations SHOULD be specified as a schema:Place complete with a fully described geographic location and/or address. If only an address is available then this SHOULD be described as a schema:PostalAddress. Applications MAY use schema:Text to provide a more general description of a location ("In Victoria Park, near the lake"), but this is not recommended: consuming applications will be unable to help users discover opportunities based on their location. schema:organizer RECOMMENDED The person or organization ultimately responsible for an event. An organizer might be an schema:Organization or a schema:Person. schema:contributor RECOMMENDED A schema:Person, e.g. a coach, staff member or volunteer who will be helping to run the event. schema:schedule OPTIONAL A schedule defines a repeating time period used to describe a regularly occurring Event. **Note: this is a draft Schema.org property. See Issue) for discussion. oa:category RECOMMENDED Provides a set of tags that help categorise and describe an event, e.g. its intensity, purpose, etc. oa:attendeeInstructions OPTIONAL Provides additional notes and instructions for event attendees. E.g. more information on how to find the event, what to bring, etc. oa:accessibilityInformation OPTIONAL Provide additional, specific documentation for participants about how disabilities are, or can be supported at the Event. oa:isCoached OPTIONAL A boolean property that indicates whether an Event will be coached. This flag allows an Event to be marked as being coached without having to specify a named individual as a coach. This addresses both privacy concerns and also scenarios where the actual coach may only be decided on the day. oa:level OPTIONAL A general purpose property for specifying the suitability of an event for different participant “levels”. E.g. beginner/intermediate/advanced. Or in the case of martial arts, specific belt requirements. Values SHOULD ideally be drawn from a controlled vocabulary. oa:meetingPoint OPTIONAL Instructions for the attendees of an Event about where they should meet the organizer or leader at the start of the event. Some larger locations may have several possible meeting points, so this property provides additional more specific directions. This basic description can be improved by providing information about its location and organizer. The Physical Activities used to describe an event may be drawn from a standard Activity List, e.g. the OpenActive Activity List ([ OpenActive-Activity-List ]). Applications could include additional information, e.g. alternate labels for convenience of consumers. And, as shown in the earlier example, multiple activities can be specified by specifying an array of objects. The oa:category property can be used to associate an Event with one or more tags that provide some extra context about an event. This might include general information on the intensity and suitability. While this property can be used to add any arbitrary tags to an Event, a common use case is the need to tag an event as being suitable for a specific type of audience, e.g. Beginners. Where this information is available, the oa:level property can be used in preference to oa:category. If an application does not distinguish between different types of tags associated with an Event, then it SHOULD use the more general oa:category property. Applications publish data using the oa:category and oa:level properties MAY use values either from a controlled vocabulary or more free-form user entered labels. Where an application is using a controlled vocabulary it SHOULD publish that vocabulary as structured data. In future, the OpenActive Community Group may decide to define and recommend some controlled vocabularies for use in these properties. At present the values of these properties are left deliberately open to encourage publication of open data that may inform future standardisation. "description": "Getting started in rowing couldn’t be easier!" This specification relies on some pending changes to Schema.org that will add recurrence rules to Events. The proposal has been accepted, but is not yet formally part of the model. We expect that this proposal will become part of Schema.org in due course. This process will be driven by implementation experience and feedback from the community. On that basis we have included the terms in specification. The following section is written on that basis. However both publishers and consumers should be aware that this is an area that may change in future versions. Schema.org provides a couple of basic properties for describing the maximum (schema:maximumAttendeeCapacity) and remaining capacity (schema:remainingAttendeeCapacity) for an schema:Event. These properties can be used to provide some basic availability information for scheduled events. These are illustrated in the following example which states that a Tai chi class can be attended by up to 20 people and that there are 4 spaces remaining. An schema:Event may occasionally be rescheduled or cancelled. Schema.org provides the schema:eventStatus property for indicating the current status of an event. If the status property is not provided then applications SHOULD assume a default value of http://schema.org/EventScheduled. "accessibilityInformation": "The location is fully accessible, please contact the organiser if you have questions"
Schema.org takes a flexible approach towards defining the locations for an schema:Event. While all three forms are allowed by Schema.org, applications that publish opportunity data SHOULD either specify a schema:PostalAddress or a more detailed schema:Place description. Schema.org provides the following properties for publishing address data using the schema:PostalAddress type. In order to provide additional information, e.g. the name of the location or its geographic co-ordinates, then the schema:Place type MUST be used instead. schema:openingHoursSpecification OPTIONAL Specifies the opening hours of a location. The value of this property is a schema:OpeningHoursSpecification. While the schema:Person type allows a variety of information to be published about a person, applications MUST not publish this information as open data without consent. To describe the people and organisations involving in organising Events, Schema.org provides the schema:Person and schema:Organization types. Both the schema:Person and schema:Organization types support a common set of properties that capture the basic information required for publishing opportunity data. activities to be organised into hierarchies to capture broader-narrow relationships, e.g. "Martial Arts" and "Judo"
The concepts property used in the above example is defined in the JSON-LD context published as part of the OpenActive Vocabulary ([ OpenActive-Vocabulary ]). The following properties from the [ SKOS ] specification can be used to describe physical activities. skos:prefLabel REQUIRED Preferred label for referring to the physical activity. The preferred labels should be used when publishing data about the activities involved in an event. skos:inScheme RECOMMENDED Refers to the Activity List in which this physical activity is defined. skos:broader OPTIONAL Where an Activity List is organised as a hierarchy of activities, this property can be used to refer to a parent or broader term. E.g. "Martial Arts" is broader than "Tai Chi". skos:narrower OPTIONAL Where an Activity List is organised as a hierarchy of activities, this property can be used to refer to a child or narrower term. E.g. "Tai Chi" is a narrower term of "Martial Arts"
The following markup illustrates how to describe a single activity. To indicate that a schema:Event is only available to paid attendees, opportunity data provides may include details of the offers available to participants. The schema:Offer type provides some basic properties for indicating the price and availability of Offers. schema:priceCurrency REQUIRED The currency of the offer price. The following example shows an event which offers a price for attending a single session. Schema.org provides additional properties for describing Offers. The above model highlights the properties that support the most common, basic use case. Future versions of this specification may include more detail around describing offers. As described earlier in this specification, an Activity Opportunity is similar to an Event except it does not take place at a specific time: individual participants will decide when they will take part in the physical activity. The oa:ActivityOpportunity type will be used to represent these opportunities. Information about Activity Opportunities can be published using the same set of properties that have been identified for Describing Events. However applications MUST not use the schema:schedule, schema:startDate and schema:endDate properties on this type of resource. The previous sections describe how to publish opportunity data using a combination of existing and new vocabularies. But this approach may not address every requirement. Specific applications may need custom extensions and the community may need to revise or improve the core model presented here. Future versions of the specification may have a wider scope, e.g. to support description of facilities, equipment, event booking or accreditation schemes for sporting organisations. With this in mind, the following sections briefly outline some expected ways in which this specification and the practice of publishing of opportunity data may evolve. To support changing practice, consumers of opportunity data SHOULD be liberal in what they accept from data publishers, to allow the use of additional properties. The broad goal is to ensure that future versions of this specification remain backwards compatible. This will ensure that published data remains valid. New types of resource, relationships and properties can easily be added to extend the model without impacting existing data. Potential breaking changes would include changing the definitions of existing properties, or removing them from the specification. evolve the definitions of existing properties to broadly retain their current meaning and legal values. deprecate, rather than remove properties that are judged, based on implementation experience, to be less useful or confusing. Deprecated properties will be clearly marked in both the human and machine-readable versions of the OpenActive namespace. Proposed changes to the specification will also be communicated in advance of their formal release, through the sharing of public Editor's Drafts. This will provide opportunities for both publishers and users of the data to update their applications. To support additional testing and experimentation around new properties, a "beta" namespace has been defined to allow the community to explore extensions to this specification in a controlled way. For more information on the process supporting that see [ OpenActive-Beta-Namespace ]. Regardless of the type of extension, activity can continue to be co-ordinated within the OpenActive Community Group as the primary forum for standardising the publication of opportunity data. This specification draws heavily on [ SCHEMA-ORG ] and [ SKOS ] to define its core data model. Both of these specifications define additional properties that are not directly referenced in this document. However data publishers are free to use any additional types and properties where useful. [ SCHEMA-ORG ] in particular provides a source of a wide range of additional properties for describing Events, Places, Organisations, etc. For example an application may wish to share reviews of events, places or clubs. The schema:review property and its related data model can be used for this purpose, without requiring revisions to this specification. There may be a need for new vocabulary to support the needs of specific applications or user communities. Where these are widely relevant then these extensions might be included in this data model. In other circumstances its expected that additional data models and specifications will be produced to support the needs of those communities. For example it may be useful to define standard models for describing the characteristics of cycle tracks or orienteering trails. These would be better defined either as custom vocabularies or proposed as [ SCHEMA-ORG ] extensions. [ JSON-LD ] allows data to be published with reference to multiple contexts. This will help clarify for reusers where a dataset is combining this specification with one or more custom vocabularies. The editors thank all members of the OpenActive CG for contributions of various kinds.